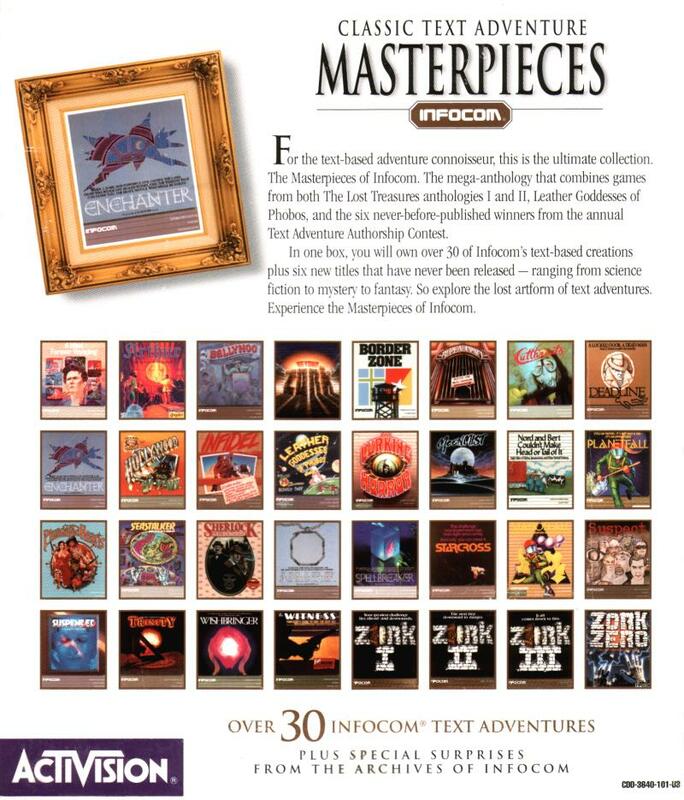 Activision published a number of Infocom collections over the years which have become priced collector's items themselves. The biggest of them was "Classic Text Adventure Masterpieces" (see left, click to enlarge) and contained over 30 games. 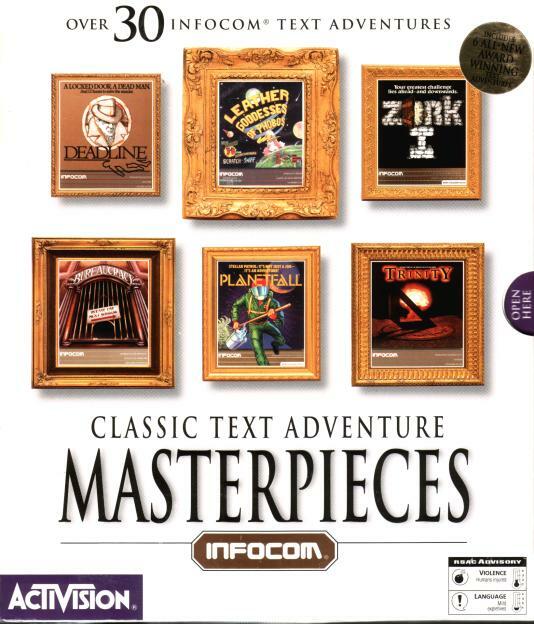 From time to time this collection resurfaced in a jewelbox version in Activision's online store, but in the last three years hasn't been seen there again and at the moment there are no references to Infocom or related games on the Activision site at all. Activision was working on a new and improved compilation, which was scheduled to be released in 2005 or 2006, but as the main driving force behind it has left Activision, its status is now in hiatus (see news). This new compilation was supposed to remedy some of the downfalls of the "Masterpieces," like the inadequate PDF-documents that formed the manuals and would probably have included "Shogun" and "The Hitchhiker's Guide to the Galaxy," which due to licensing reasons were not part of the "Masterpieces." 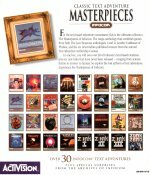 Interdata Developments, a small company in the UK, had large quantities of the European "Essential" release of the "Masterpieces" available in boxed and jewelcase only versions. These had no differences to the US release beside the box design, the contents of the CD were the same, and Interdata became highly popular as the "secret source" for the collection. But for a good while now Interdata appears to be out of stock, although a new shipment was supposed to arrive in the mid of January 2003. Apparently that hasn't happened, but you might want to check there occasionally. 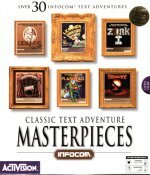 You can find original Infocom releases at ebay, the popular Internet auction house. Try "Infocom" and/or specific Infocom titles as search topic and search auction titles as well as their descriptions. Some people describe an Infocom game in their auction titles, others do so only in the descriptions. Usually prices and conditions of the games vary a lot, depending on whom you buy from or if you want a specific edition of a game. Look out if the game you want is available more than once and compare prices. It can also help to search ended auctions and see for how much the game your are looking for was sold - it might give you an idea on the money you will need to invest. Through the years also certain trends emerged in the collectors scene and specific titles become more popular, depending on current preferences. If you happen to want an at the time very much wanted title or edition, prepare to pay more. A factory sealed "Starcross" saucer can sell for more than $1000 as it hardly ever surfaces, but an influx of the game in this package and condition would most likely lower the prices greatly. This leads to the next important part of the price a game is sold for: It's condition. Are all the goodies that came with the game still with it? Is the box not crumpled or faded? Is the manual not torn? Is the disk not missing? And so on. Information what the box should look like and what should be in it can be found by looking at the large front and back cover scans in the games section on this site. If the condition of the game varies greatly from the original it is worth much less, which is esp. true for missing goodies, while an originally sealed box, as the above exampled "Starcross" saucer, is worth more. If you want to go the safe way and buy only sealed games, ask the seller if the game is originally sealed, meaning sealed by Infocom, not a "reshrink" done by the seller or whoever he acquired the game from. In short: Before you buy on ebay, make sure what you are going to bid for is worth your money and really the title and release you are looking for. And be aware that although most people on ebay are honest, events like this can happen. The "Infocom Shoppe" (or "YOIS") is a collector's site par excellence and maintained by probably the master of all collectors himself: C.E. Forman can boast the largest collection of not only Infocom, but generally all interactive fiction releases and his site is also good source for general collecting information and estimates on how much a title or one of its editions are worth. He usually has a good number of items for sale and maintains a list of what is available. If you are looking for a very special Infocom title or a missing item from a box you got, but also if you just want to get your hands on a game, browse through the "Shoppe." What YOIS is for the USA, is the Cornershop for Europe. Based in the UK and maintained by David Aston, the Cornershop is specialized on Infocom titles and has a broad variety for sale. A great place to shop for European buyers, as this will lower their shipping costs considerably.